The CSEP infrastructure is distributed on a virtual image that can be installed at your testing center. Contact us for access to the image. The Collaboratory for the Study of Earthquake Predictability (CSEP) supports an international effort to conduct and rigorously evaluate earthquake forecasting experiments. 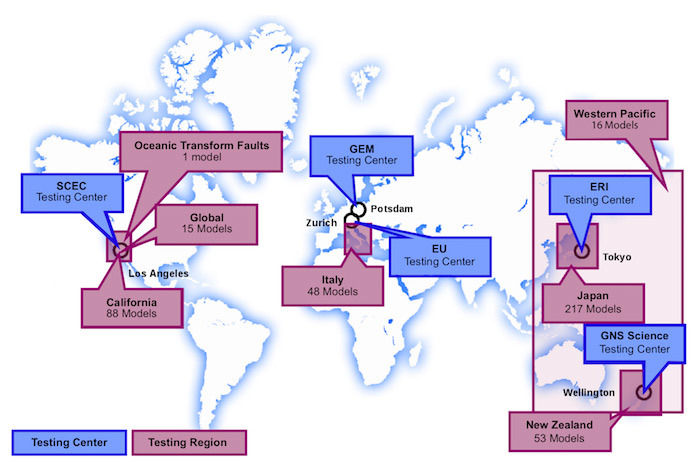 This unique facility accelerates progress in prediction research by functioning as a new type of environment for earthquake prediction experiments: a virtual, distributed laboratory (collaboratory) with a cyber-infrastructure adequate to support a global program of research on earthquake predictability. CSEP testing centers are now operational in California, New Zealand, Japan, China, and Europe with 442 models under current evaluation. The California testing center, operated by SCEC, is testing 30-minute, 1-day, 3-month, 1-year, and 5-year forecasts for California, the Western Pacific, and global regions. This earthquake system science approach seeks to provide answers to the questions (1) How should scientific forecasting experiments be conducted and evaluated? and (2) What is the intrinsic predictability of the earthquake rupture process? Promote research on earthquake predictability through the SCEC program and its global partnerships. Help the authoritative government agencies assess the feasibility of earthquake prediction and the performance of proposed prediction algorithms. Reduce the controversy surrounding earthquake prediction through a collaboratory infrastructure to support a wide range of scientific prediction experiments. Establish rigorous procedures for registering and evaluating earthquake forecasting and prediction experiments. Construct community standards and protocols for comparative testing of earthquake predictions. Develop an infrastructure that allows groups of researchers to participate in prediction experiments. Provide access to authorized data sets and monitoring products for calibrating and testing earthquake prediction algorithms. Accommodate experiments involving fault systems in various geographic and tectonic environments. Evaluation procedures for fault-based forecasting models. Currently, UCERF3 generates earthquake probabilities for California on a fault-by-fault basis. While this fault-based approach is favorable for PSHA, evaluating the performance of such models poses challenges for the current CSEP infrastructure. Researchers are currently working on developing new techniques to assess fault-based forecasting models such as UCERF3. Evaluation procedures for simulation-based forecast models. Within CSEP, earthquake forecasts are evaluated using statistical tests designed to assess different aspects of the forecast, such as the expected number of earthquakes or their distributions in space. Forecasting algorithms typically provide expected earthquake-rates, so the bulk of forecast-evaluation theory developed for CSEP prioritizes these types of models. To provide tools to evaluate all types of earthquake forecast models, researchers are working to understand the requirements of evaluating forecasting models specified as earthquake catalogs. Capabilities to support ensemble models. CSEP evaluates dozens of earthquake forecasting algorithms - all based on differing methodologies or data sources used to inform their forecasts. Ensemble modeling allows several models to be combined in hopes of improving the predictive capabilities as compared to a single forecast. This capability requires advanced statistical techniques that are currently in development by the CSEP working group. New earthquake forecasting algorithms. CSEP always welcomes the development of new forecasting algorithms. If you a scientist interested in participating in CSEP please contact us.